Following the practice of traditional department stores that take their name from their founder, my exhibition is entitled Isenstein’s, along the lines of Macy’s in New York City, where I live, or Karstadt in Berlin. 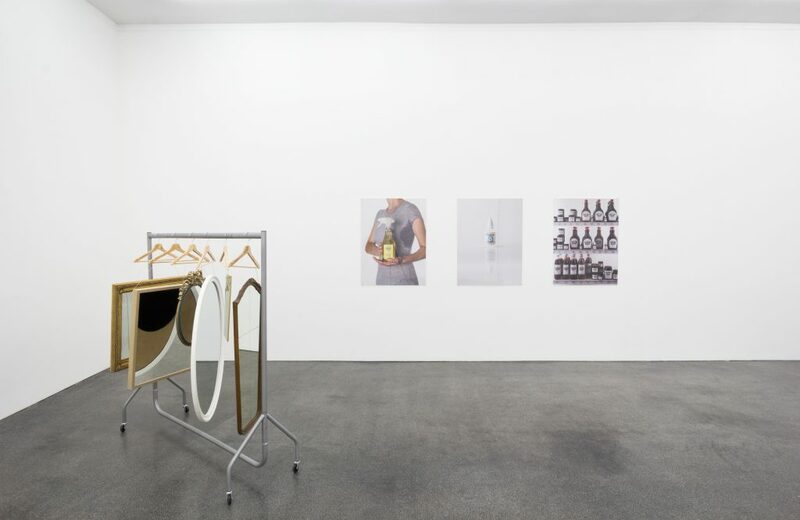 As might be expected of an exhibition named in the tradition of a store who’s namesake is a person, the artworks in the exhibition consider the body within the world of commerce; how this world shapes our bodies and our sense of our selves, and how our experience of our bodies informs the world of commerce. We are what we buy. In this exhibition, death is a specter that hangs over commodities as they sit in stores waiting to be purchased. Fashion and innovation create this condition. In their continual desire for the new, fashion and innovation are always sweeping away the old. As a result, while for sale, but more acutely the moment objects are sold, they begin to become outmoded and obsolete. 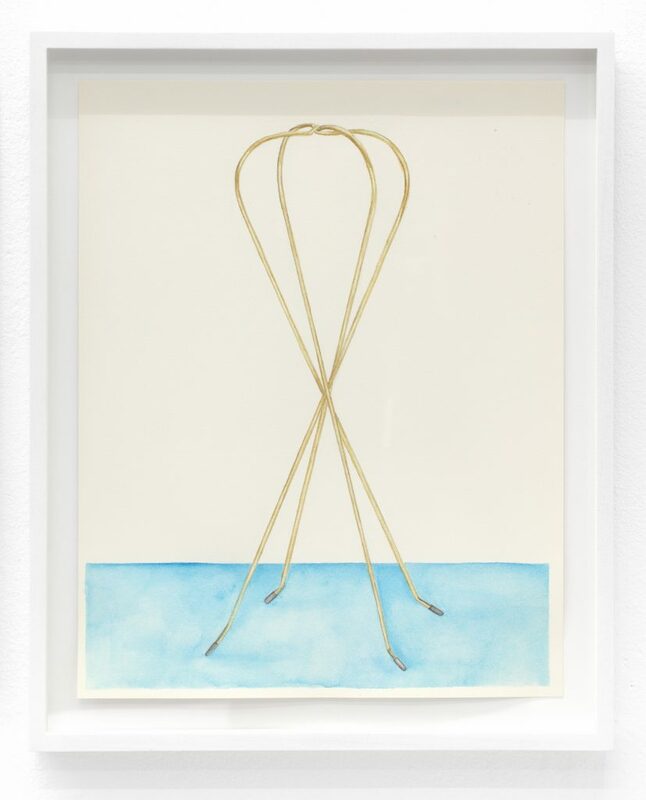 Therefore these objects become metaphors for the body and it’s attendant mortality. In this exhibition, objects have their own life process. They change and grow old and otherwise reflect on the futility of attempting to be fashionable, to cheat death. 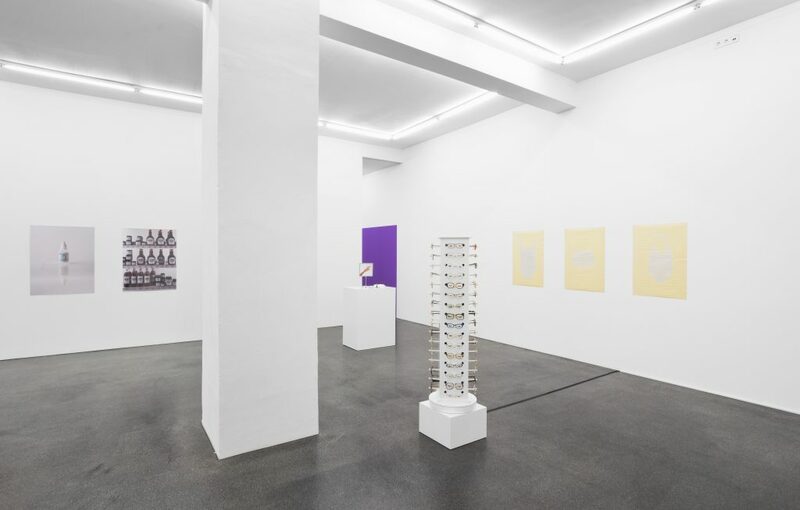 Retail store displays and various advertising formats are used throughout the exhibition as frameworks for exploring these ideas. The body’s relationship to artifice through commerce is another theme within the exhibition. 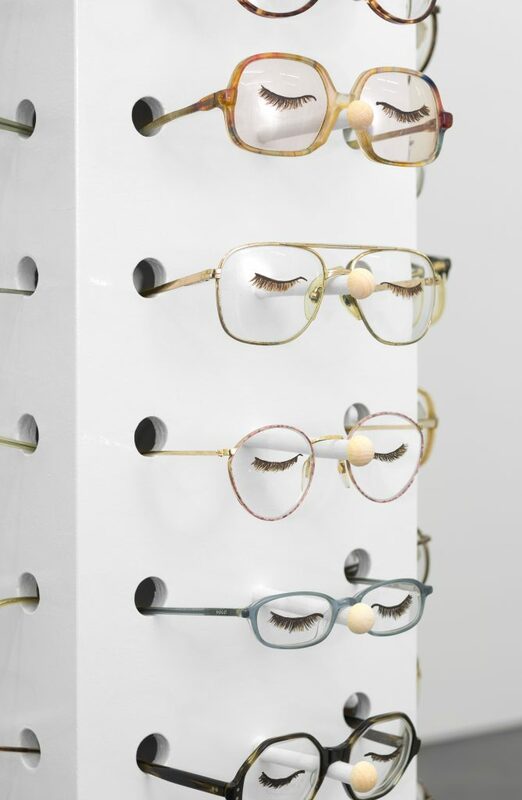 As products combine with the body, the line between what is natural and artificial is increasingly blurred. 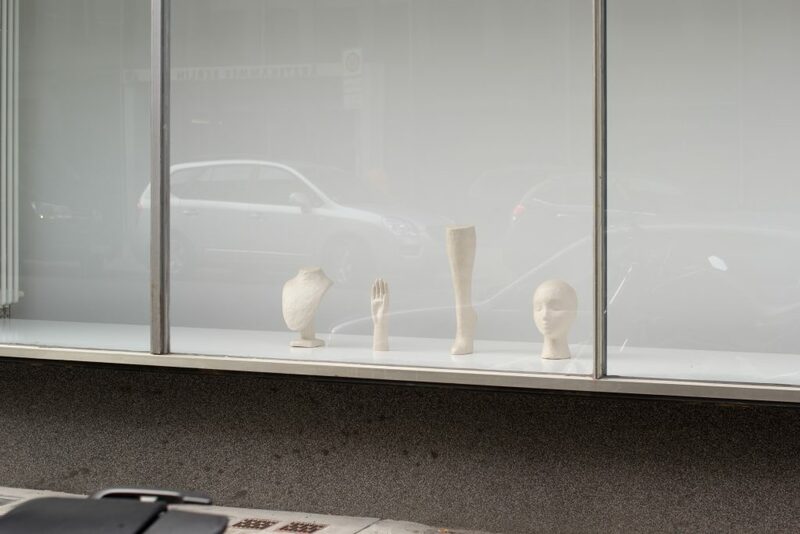 In the front window of the exhibition are a series of retail display body parts. Each one is made of paper mache using blank newsprint. As the works sit in the sun the newsprint will slowly turn yellow and “tan”. Also in the exhibition is a series of posters that look like ghostly clothes advertisements. These are newsprints that have laid in the sun with bathing suits on them to create a photogram where the paper becomes sun bathing skin. Conversely the work also suggests that the body exposed to sun becomes a photograph. Three photographs in the exhibition act as advertising posters that depict obviously fake versions of real products. These products are themselves artificial substitutions meant to replace human bodily fluids. One photograph is of a store display of fake bottles of fake blood used in theater and film. Another depicts a fake bottle of artificial tears meant to relieve dry eyes. 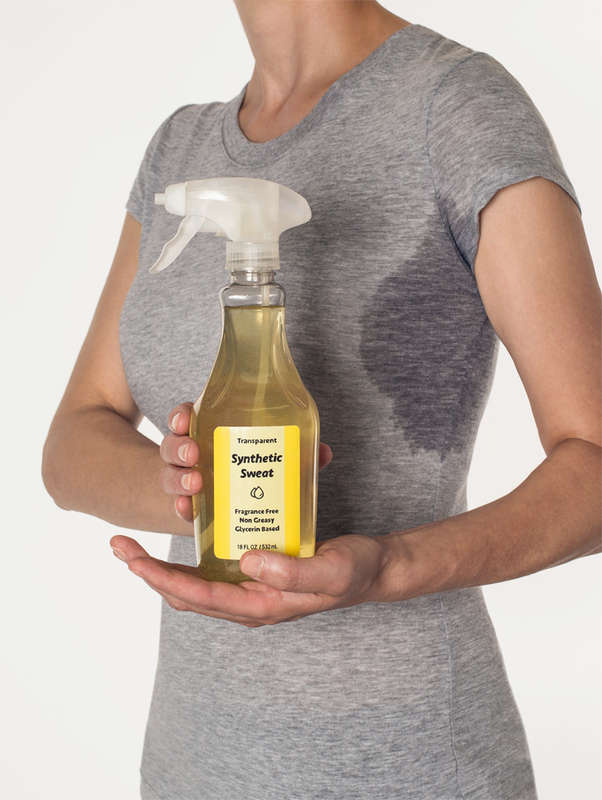 A third image is of a fake bottle of synthetic sweat, a solution used in industry to test the durability of products that interact with our sweaty bodies. Also in the exhibition, a sign advertising a watch sits on a pedestal. The watch in this sign is handmade from modeling clay. A mannequin hand on the pedestal wears a real version of the watch. This watch must be hand wound every day to maintain it’s life while the watch in the photograph remains static and yet enlivened by its hand-made quality. 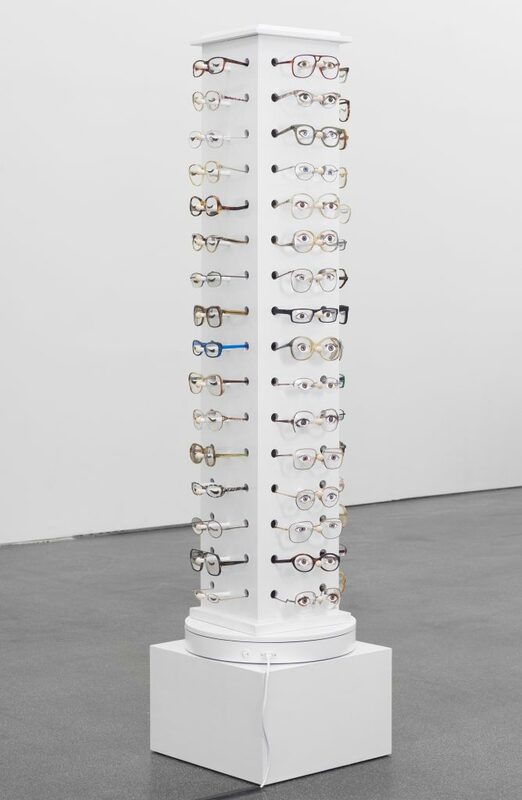 Another work, a glasses display tower that slowly spins shows off glasses with open and closed eyes painted on the lenses. As the tower spins, the work suggests a kind of slow moving zoetrope of blinking eyes. 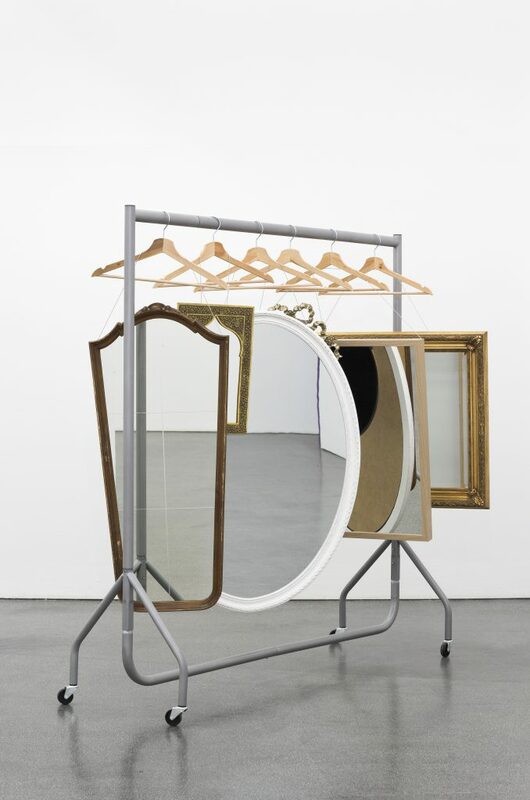 A series of mirrors hang from a garment rack. Where clothes should be is instead a reflection of the person viewing the work as if to suggest their own clothes or bodies are for sale. 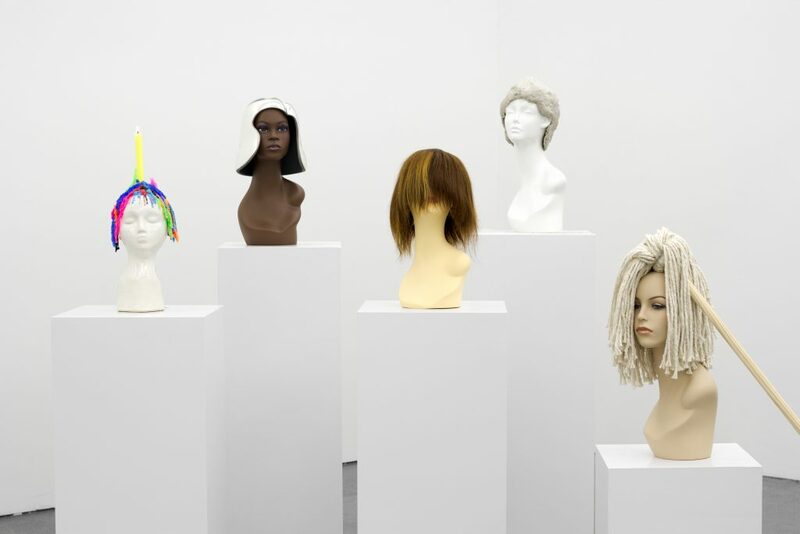 Also in the exhibition is a chorus of five mannequin heads wearing wigs that each suggest vanitas themes. One wig is created by a candle that sits on the mannequin’s head. As the candle burns, the hair grows. Another wig is a pile of sand that can be reshaped. A third wig is a mop and a fourth wig is a mirror. The fifth wig is made from human hair cut from mannequins used by hairdressers to practice new styles. The idea for this wig is to redeem the hair. As it was taken from a human and given to a mannequin, by being turned back into a wig, this hair can theoretically be worn by a human again. Also in the exhibition is a collection of these same hairdresser mannequin heads, already with haircuts packaged in a bag, ready for sale. The hair on these heads is human and could even be traced through DNA back to the person who grew the hair. The mannequin heads are extremely commonplace but often the hair is obtained from desperate and exploited women in third world countries. In the world of fashion and commerce, no one is safe. 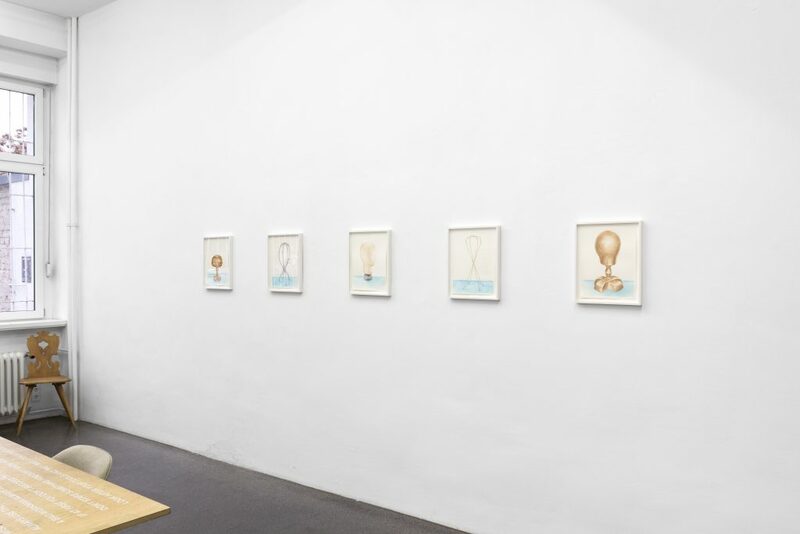 Jamie Isenstein ‘Isenstein’s’ Installation view at Meyer Riegger, Berlin. 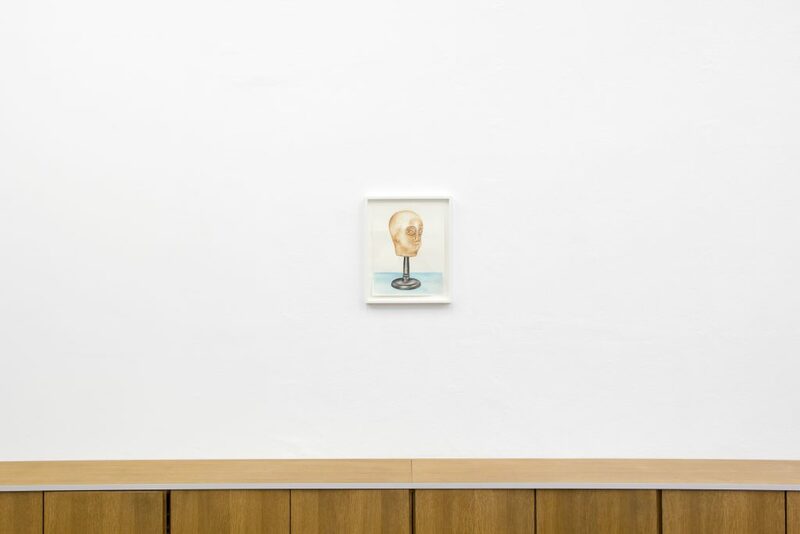 Courtesy Meyer Riegger Berlin. group of five wigs, dimensions variable. 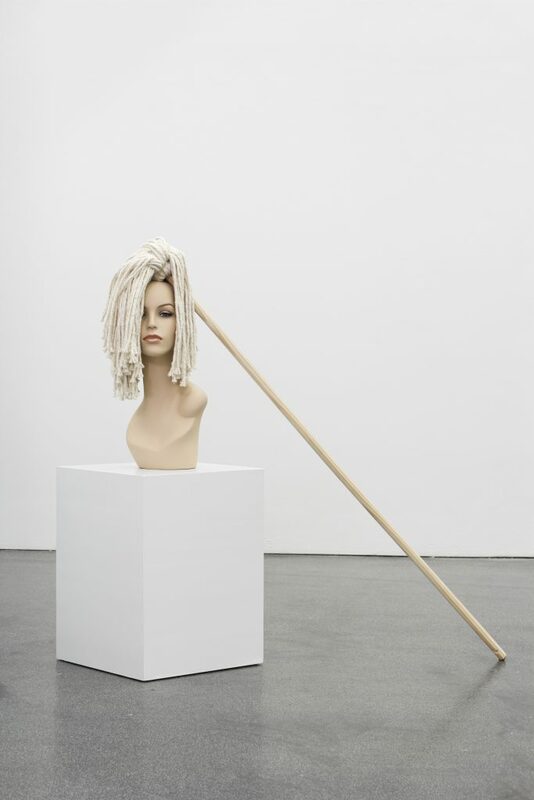 cotton and wood mop worn by fiberglass mannequin, 58 x 22 x 17 cm. 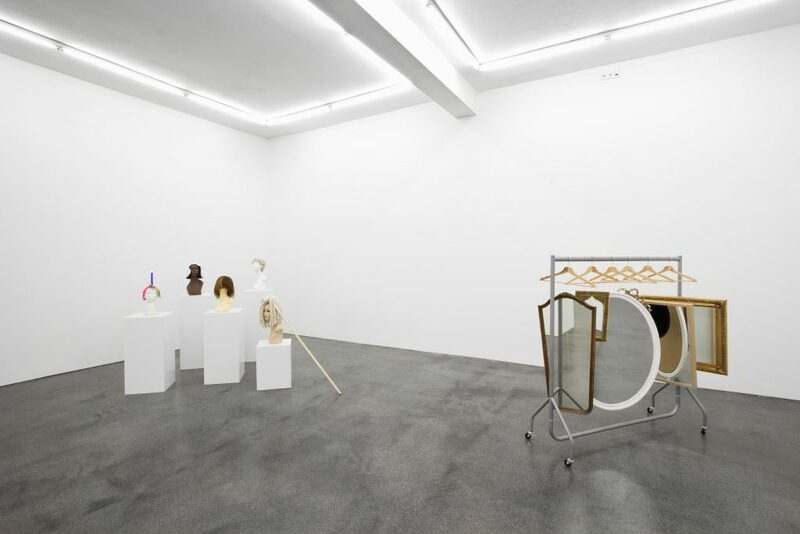 six mirrors, hangers, wire, garment rack, 154 x 153 x 56 cm. c-print mounted on plexi, 101,6 x 76,2 cm. 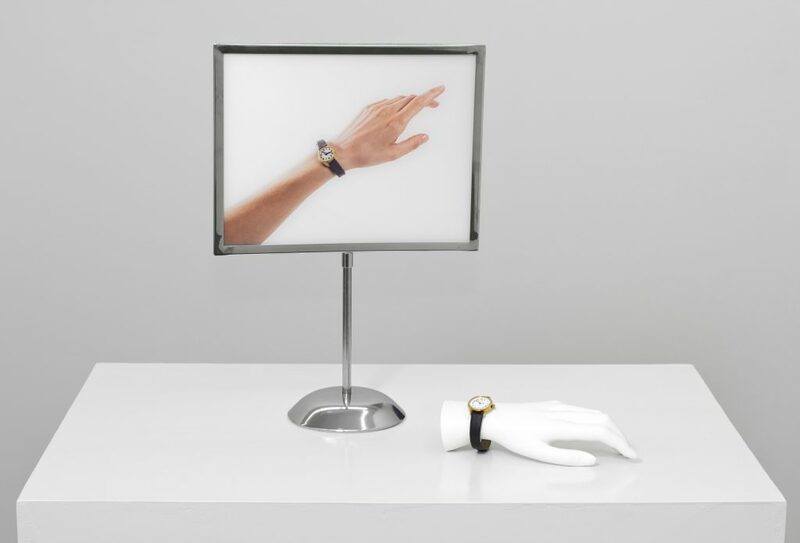 C-print mounted on plexi, display stand, mannequin hand, plaster, wound-up watch, mannequin hand: 4 x 20 x 7,5 cm, print: 40,5 x 28 x 10 cm. 64 glasses, acrylic paint, wood display stand, motorized turntable, 168,5 x 40 x 40 cm. 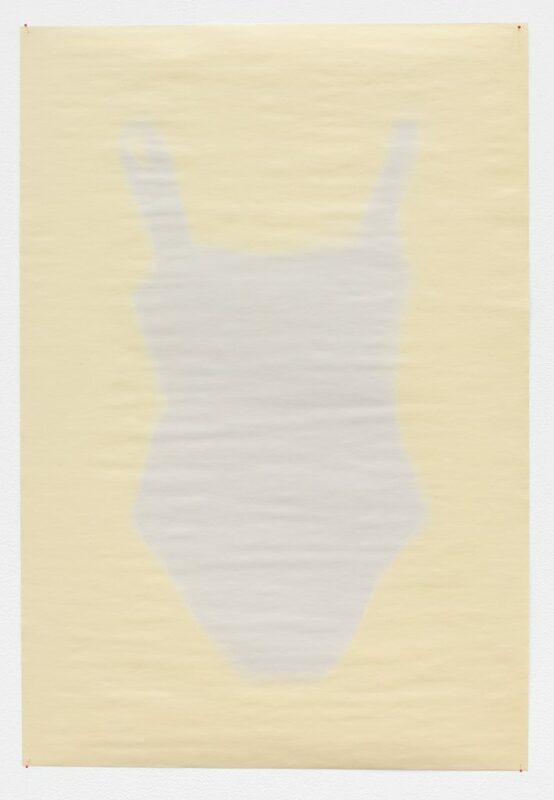 newsprint with impression of woman’s one piece turquoise bathing suit, 89 x 60,5 cm. 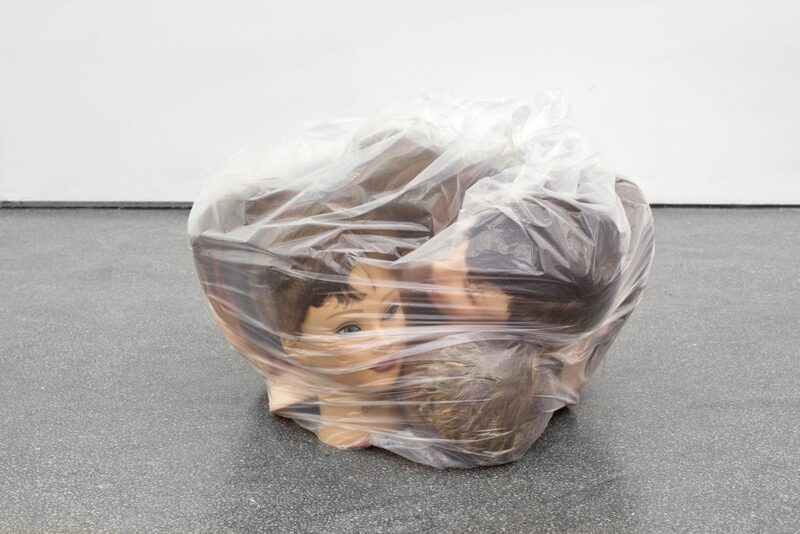 hairdresser mannequins with human hair, plastic bag, 40 x 63 x 44 cm. watercolor, framed, 41 x 33 x 3 cm.